KUT transmits on 90.5 MHz from a 600-foot tall tower located approximately 8 miles west of downtown Austin at the University of Texas Bee Cave Research Center. KUT’s analog transmitter has an effective radiated power of 100,000 Watts, and can be received in most places out to about 40 miles from the tower. Trouble with radio reception? There's more technical info here. In order to receive KUT‘s digital services, you must obtain an HD Radio™ capable receiver. They are available from many online sources, including Amazon. KUT’s HD Radio signal contains two audio streams. KUT1 (HD-1) is a simulcast of the 24-hour news and information programming from KUT 90.5 FM. KUT2 (HD-2) is a simulcast of the music programming on KUTX 98.9, the Austin Music Experience. A good antenna is necessary to receive HD Radio™ reliably. There are numerous types of antennas and what works in one location may not work well in a different spot. Find our streaming player here. KUT provides streaming audio services to computers in a variety of formats which should be compatible with any operating system. The streaming formats provided are MP3, AAC+ and HLS. We test our streaming services for compatibility with Microsoft Windows and Apple iOS. Some browsers and players, like VLC and QuickTime, will natively play an HLS stream. 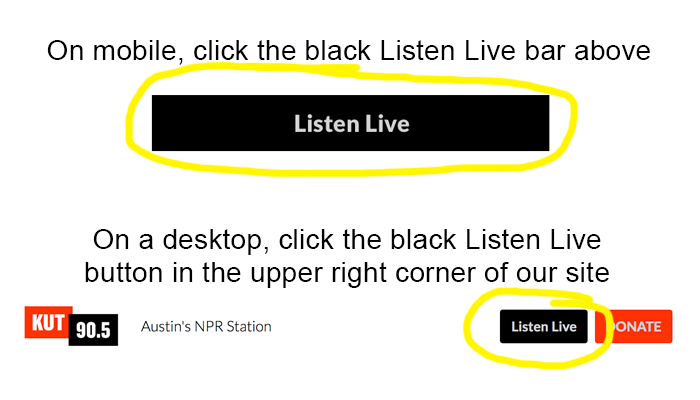 iTunes will not, but you can use the above iTunes link or search for "KUT News" in Apple Music Radio to find this same HLS stream. Our HLS streams are the highest quality streams we provide. KUT and KUTX can be streamed to your iOS or Android smartphone or tablet using our custom applications. Our apps all use the AAC+ codec. KUT is committed to supporting open media formats and free (as in speech) software whenever possible. Music licensing and royalty requirements sometimes prevent us from doing this. We make every effort to support as wide a variety of operating systems and software as we can. KUT provides all our streams to popular providers like iHeartRadio and TuneIn. We are the origin of these streams, providing them the same MP3 and AAC+ streams listed above, which you can get directly through our apps or websites. These aggregators then make our stations available on their apps and platforms. Our stations are also in iTunes under Internet Radio, plus KUT News is found in Apple Radio. A number of consumer electronics manufacturers make standalone internet streaming receivers that are compatible with KUT’s streams. These devices enable you to listen to internet streaming audio without a computer. They normally connect to your network with WiFi. Some have preset station buttons that make it easy to select the stream source. They can also play music from Spotify, iTunes shares or other music services. Most KUT/X streams are compatible with these devices. You will likely need to type or paste the direct MP3 or AAC+ links into the device directly or its software (probably browser-based). These devices are normally programmed by connecting to the device using a computer and mobile app. Use the links above to receive the stream(s) you wish to listen to.